So where exactly do your pictures live on the iPhone? The pictures you snap on the iPhone first land in a photo album appropriately dubbed Recently Added, the album formerly known as Camera Roll. In the Photos or Camera app — you can get to the former by tapping a thumbnail image in the latter — you’ll also find pictures you’ve shared with friends and they’ve shared with you through the iCloud Photo Sharing feature. The photos you imported are readily available too and are grouped in the same albums they were in on the computer. Check here for more on importing pictures to your iPhone. Moreover, as part of iOS 8, every picture you take with your phone (and other iOS 8 devices) can be stored in a new iCloud Photo Library. You can access any of these pics if you have a Wi-Fi or cellular connection to the Internet. No more fretting about images hogging too much storage space on your phone. You can still download to the phone images that you want available when you’re not connected to cyberspace. 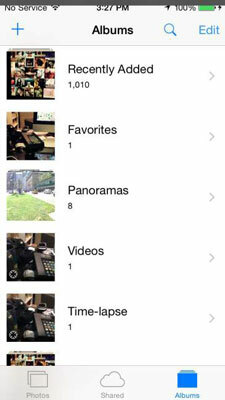 Open the Photos app by tapping its icon on the Home screen or by going through the Camera app. Then take a gander at the trio of buttons at the bottom of the screen: Photos, Shared, Albums. iOS 8 has one more feature to help you find a given photo among the thousands if not tens of thousands you’ve shot. You can search your entire photo library in the cloud. From the Photos app, tap the search icon, the one that resembles a magnifying glass. Apple has kindly grouped some of your pictures into potentially helpful search categories: Nearby, Home, those taken from a specific time period or location, and Favorites, which are so designated each time you tap the heart icon below a chosen image. You can also consult a Recent Searches grouping. Or just type a search term with the onscreen keyboard, perhaps the date or the time a photo was taken or the location where it was shot.